(Nanowerk News) An extensive experiment testing the immune effects of a broad group of lab-designed nucleic acid nanoparticles did not find a strong, uniform immune response, as had been predicted. Instead, the tests found varying and specific responses from different immune cells, depending on each particle's shape and formulation, a finding that may encourage further study of the particles' therapeutic use. 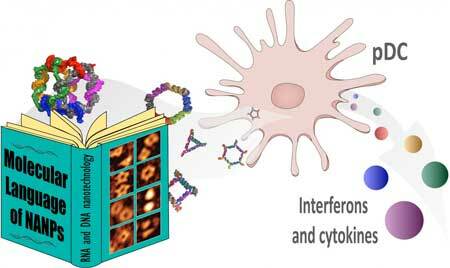 The findings were recently reported by Enping Hong, Ankit Shah, and Marina Dobrovolskaia of the Frederick Laboratory for Cancer Research, Emil Khisamutdinov of Ball State University and Justin Halman and Kirill Afonin of the University of North Carolina at Charlotte in the journal Nano Letters ("Structure and Composition Define Immunorecognition of Nucleic Acid Nanoparticles").